Among the very first things I purchased when I landed at Woodland Park were several plastic house gutters: I think we currently have four 6-foot lengths, and we're down to one 10-footer. I purchased them not for flowing water as they're most often employed today, but rather for use as tennis ball runs. 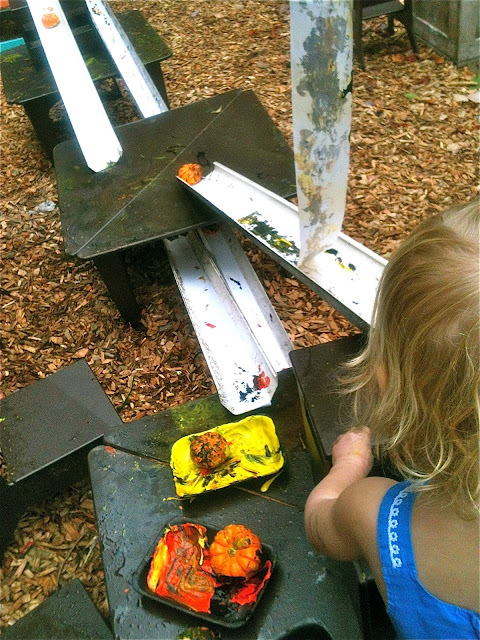 In our more indoor-based former location, I would build elaborate gutter-runs, using blocks, furniture and duct tape, one-trick ponies designed to stay more or less rigidly in place as kids watched their balls roll through my Rube Goldberg-esque creations. It was cool, but I spent most of my time role-modeling tinkering rather than leaving it for the kids to do on their own. These days, the set up is more like, "Here are some blocks, some balls and some gutters." It didn't take us long to start using balls and gutters to make art. My original set up was to flip our large art table, line the bottom with a layer or two of butcher paper, then prop gutters up on the backs of chairs, angling them onto the paper. 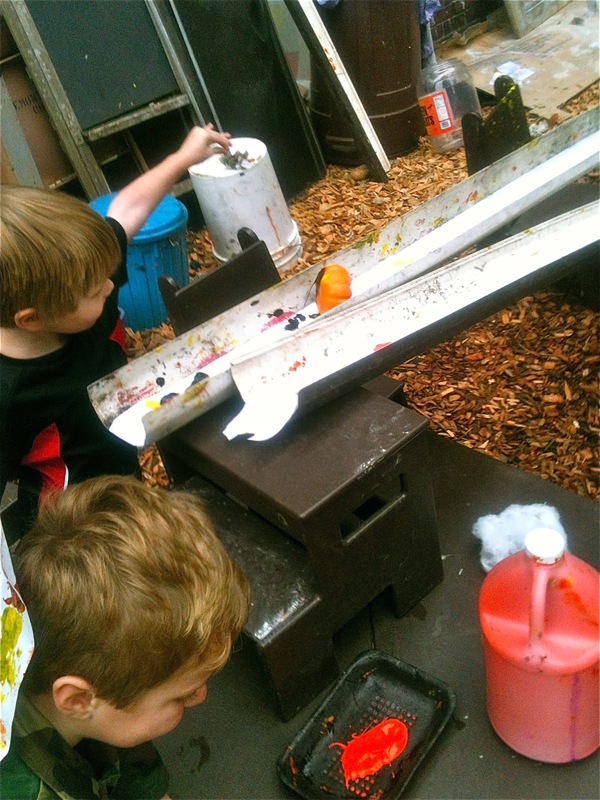 For me, the best part was when I then lined the gutters with adding machine tape. I find it quite gratifying to let the tape roll down the gutter, unfurling itself as it goes, challenging myself to beat it to the bottom -- even after all these years, it continues to be a joy for me. 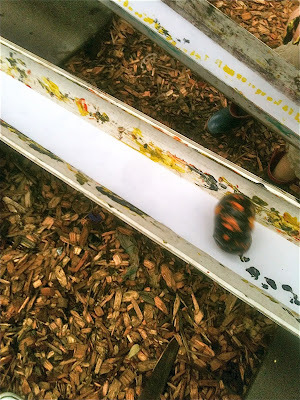 The idea is to then dip your balls (the best are those hard rubber juggling balls) into tempera paint and rolls them down the gutters, creating paint tracks on the adding machine tape as well as the paper at the bottom. I've never really expected to actually keep the final product, but the paint markings made by the balls are a type of documentation, so we like to at least notice them as we play, reminding ourselves of where we have been. We've sometimes replaced the balls with cheap plastic cars in this set up, which is a similar type of play with a nice dramatic element. Around Halloween, we use mini pumpkins. There was a time when I worked this set up the way I did those old tennis ball runs, carefully planning and anchoring everything, putting the focus on playing with the toy I'd made for them rather than on the children making it their own toy. 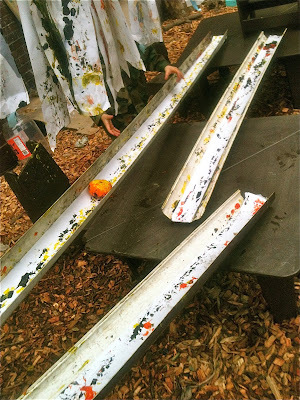 This year I more or less tossed the gutters, mini pumpkins, paint, and adding machine tape out there and said, "Here are some gutters, mini pumpkins, and paint," although I still took a moment to enjoy demonstrating the tape unfurling, letting the roll race down the gutters. 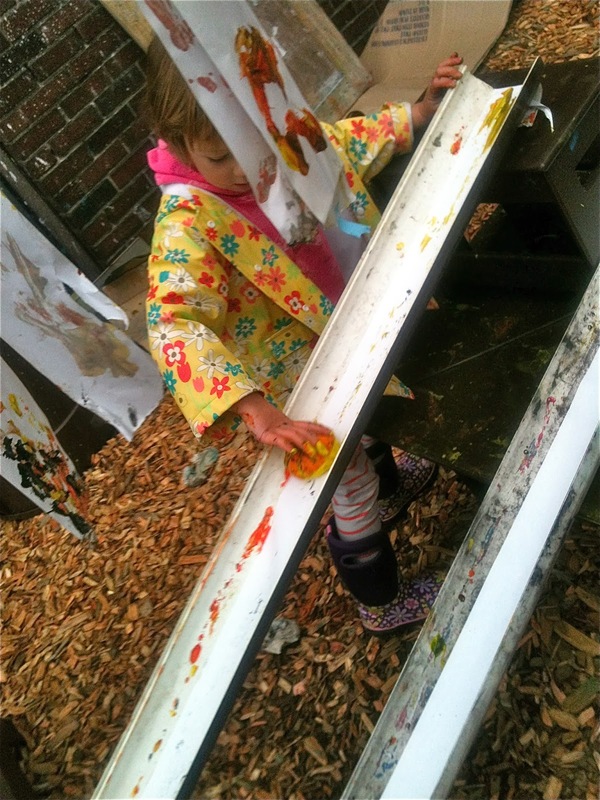 It's not a project that usually attracts all of the kids, but for the kids who like this kind of messy, full body, experimental tinkering, it's one of the best days of the year. The pumpkins are particularly interesting because unlike the balls that predictably race down the gutters, they require a combination of technique and an adequate slope: getting one to rumble down on its side is the most reliable method, but if the angle is steep enough, you can get one to bounce down end-over-end, which creates its own special print pattern. This year, I found a fellow adding machine tape enthusiast in my friend Hazel, who took charge of regularly replacing the tape, perfecting the technique of beating the roll to the bottom, even figuring out how to crimp the paper so it was anchored at each end, which is why we now have dozens of long, festive ribbons to use to decorate for our upcoming Halloween party. Yesterday, I wrote about the centrality of non-standardized, real world, open-ended goofing off to educating a human being, what Kurt Vonnegut more crudely, a probably more accurately, called "farting around." I suppose when it comes to putting together the "sales pitch" for what our curricula is all about, "goofing off" and "farting around" really aren't improvements on "free play," but they are entirely accurate. Outside this bubble, there are a lot of grown up people who've decided that children can't be trusted with their own education, that they are inherently lazy or frivolous or blithering. They write to me that if children are allowed too much play, they will never learn how to work hard or take responsibility or obey or that they'll grow into spoiled brats; mean-spirited fun-stealers all of them, ignorant about the way human brains work. They replace play with tedium and rote because, I guess, since the poor kids have to learn some time, and it might as well be when they're quite young, that this is a nasty, brutish, Hobbsian existence and their instincts must be controlled, a self-fulfilling prophesy if I've ever heard one. I would not want to live inside of those minds. I have no interest in controlling children or any of the other people (except perhaps when I'm driving which is why I try to cycle as much as possible). 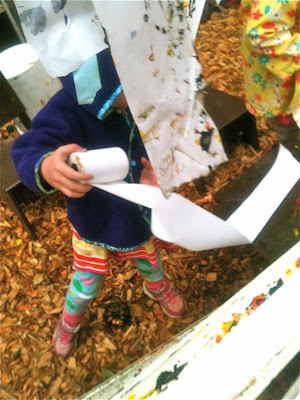 I'll confess that it angers me when someone tries to get me to provide documentation of learning beyond those strips of adding machine tape, or the absorption of children in the process of rolling balls or cars or pumpkins down those gutters, indoors and out, with paint or not. 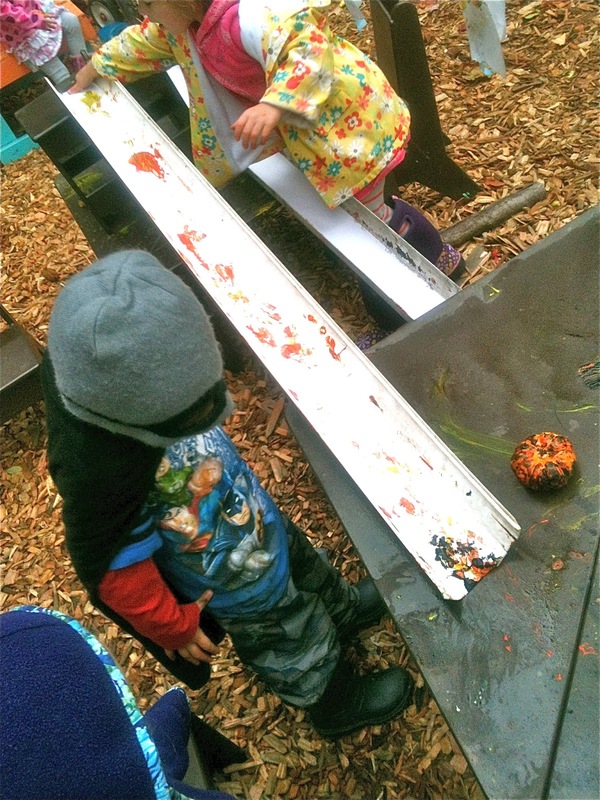 Seriously, I would not want to live inside of a mind that cannot comprehend the inherent and universal good of play: that must instead calculate data points in order to somehow figure out the learning going on inside another person's mind. I trust that the engagement is enough, that curiosity is enough, that exploration, discovery, and doing it in the company of others is enough. You see, I trust children to know what and how to learn. Yesterday morning I was with a team of two-year-olds at the cast iron pump where we were taking turns flowing water down a length of gutter. There were a half dozen of us, boys and girls. I raised the end of the gutter to rest on an overturned tub, making a small waterfall. Spencer responded by moving a bucket into position to catch the water. Cecilia then put a toy dump truck on the gutter, which rolled down into the bucket. Everyone laughed. We did it again and again, laughing harder each time, finding it funnier and funnier. I could see tears welling up in Karina's eyes. We were just goofing off, farting around, playing, learning about the world together and finding it a place of wonder and easy joy. This place does not exist where those dark-minded control freaks dwell. 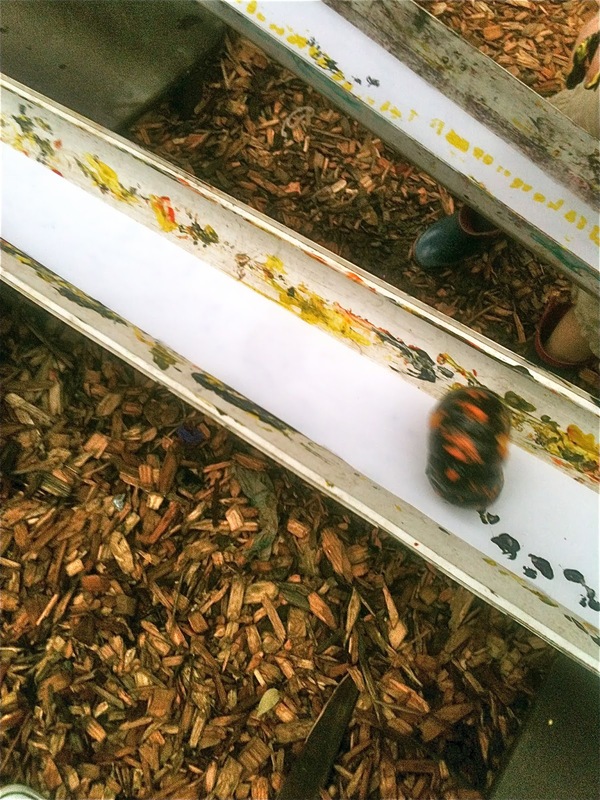 This is a place where even we adults are not exhausted at the end of the day, but rather where we absorb energy in the simple act of rolling adding machine tape down a gutter. 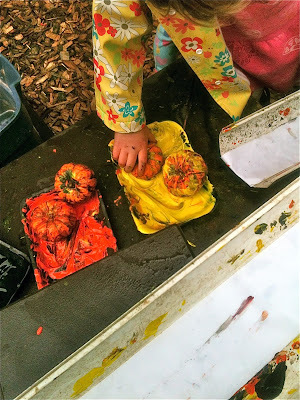 This is not about getting children "off to a good start" or helping them to love school; this is play, this is learning, deep learning. This is what it means to trust children.